Ashes of the Dead: Bucket of Blood is more than just about zombies. It deals with people struggling for survival in the face of insurmountable odds, and the sacrifices that they are willing to make to protect the ones that they love. After burying the woman he loves, a wandering gunman drifts into a small mining town on his way out west in search of a new life, but when a greedy land baron unearths an ancient burial site, a curse falls upon the town, and the Gunman must fight for survival against a legion of the undead. 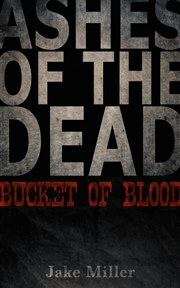 Ashes of the Dead: Bucket of Blood is a zombie western set in the 1870’s, and is for zombie lovers of all kinds. If George A. Romero and Sergio Leone had an illegitimate lovechild, this would be it. Jake Miller was born and raised in Pierre, South Dakota. He graduated from Black Hills State University with a B.S. in Biology and Chemistry, and is currently an MD/PhD student at the Sanford School of Medicine of the University of South Dakota. Jake has published several scientific articles on his research studying Batten disease, a rare and fatal neurodegenerative disorder. He co-wrote the screenplay for the short film Destroyer (https://www.facebook.com/destroyerfilm) and is also working on other feature-length screenplays with writer/director Andrew Kightlinger. 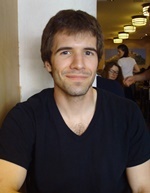 He currently lives in Sioux Falls, South Dakota with his wife Chandra and their two dogs Bosko and Brody.